It has been a long-standing principle of English law that prenuptial agreements are not legally binding. A marriage is intended to be a life-long contract – “’til death us do part”. Therefore it would be repugnant to enter into that contract whilst already planning the end of the marriage. However, in the 2010 case of Radmacher v Granatino, the Supreme Court seemed to signal a fundamental shift in this principle. When the Supreme Court handed down their judgment in Radmacher v Granatino it was reported that the Court had ruled that prenuptial agreements were now legally binding in English law. In Radmacher v Granatino, husband and wife signed a prenuptial agreement in Germany, witnessed by a notary. The wife - a wealthy heiress reputedly worth up to £100 million - wanted the prenuptial agreement because she would inherit more of her family’s wealth if her future husband was prevented from having a claim on her money. The husband - who had a well-paid job at the time - chose not to take independent legal advice. The terms of the agreement meant that neither husband nor wife would have a financial claim on their spouse's property. The couple married in 1998, spent most of their married life in London and had two children. The marriage broke down in 2006 and divorce proceedings were subsequently started. At an earlier hearing the husband had been awarded over £5.5 million from his ex-wife wife. The Judge had recognised the existence of a prenuptial agreement but decided not to give much weight to it because of the circumstances in which it had been signed. The wife appealed to the Court of Appeal where it was decided that “decisive weight” should have been given to the prenuptial agreement. This meant that the husband was only entitled to a financial award based (primarily) on his role as the father of the two children of the marriage and not for his own needs. The husband then appealed to the Supreme Court. The Supreme Court dismissed the husband’s appeal by an 8 to 1 majority. The Court recognised that there were policy reasons for the reluctance to give effect to pre-nuptial agreements. It was against public policy for a couple to enter into an agreement, before marriage, which anticipated their divorce. For the same reason the courts used to ignore “separation agreements” – entered into during a marriage but prior to an anticipated divorce. However, separation agreements have been taken into account since 1957. The Supreme Court noted that, over the years, increased weight has also been given to post-nuptial agreements. Should the circumstances in which the agreement was entered into affect the weight given to it? Was it relevant that the agreement was entered into in Germany where prenuptial agreements have been binding since 1998? Was this an added indication that the parties intended to make a binding contract? Were there prevailing circumstances at the time that the court made its order which made it fair to depart from the prenuptial agreement? Overall the Supreme Court concluded that courts should give “decisive weight” to prenuptial agreements which had been freely entered into – unless circumstances meant that it would not be fair to do so. The one judge who disagreed with the court’s decision, Baroness Hale, gave a dissenting judgment voicing her concerns about the Court’s approach to prenuptial agreements. Baroness Hale highlighted the fact that prenuptial agreements generally prevented “the economically weaker spouse (usually the wife)” from getting the financial assistance that the law would otherwise allow. 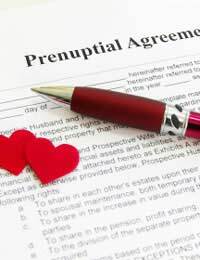 Therefore, pre-nuptial agreements tend to discriminate against women. Baroness Hale said that the Law Commission should be left to consider this issue and that any changes in the law should come after debate, as part of the usual democratic process. The Law Commission is due to report on prenuptial agreements in 2012. There is broad support for greater recognition being given to these agreements in English law – albeit subject to certain safeguards relating to the circumstances in which the agreement is entered into. Opinion remains divided as to the wider applicability of Radmacher v Granatino. Most divorces do not involve such wealthy people - and the priority in all divorces remains the welfare of any children. In most “ordinary” cases financial provision for the children takes up most, or all, of the financial resources available rendering the provisions of any prenuptial agreement largely irrelevant.